What is an ICO and how to approach it? How to get started with cryptocurrencies? Is Bitcoin killing the planet? A look at options for consensus algorithms. BEST Helsinki is a local group of the Board of European Students of Technology, working in the Aalto University Student Union. BEST is a non-profit and non-political organisation. Since 1989 we provide communication, co-operation and exchange possibilities for students all over Europe. 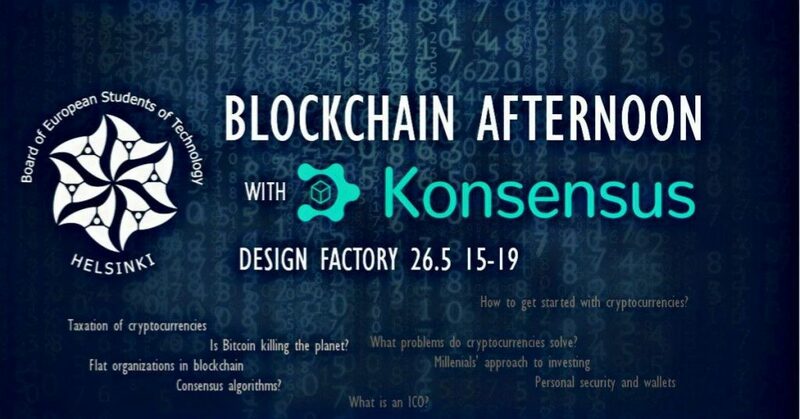 Konsensus Ry is a non-profit association, established to promote the awareness, knowledge and professional competitivity regarding cryptocurrencies and blockchain technologies. Previous: Application period open till 18.3!